Have you ever "lost" a window because it was grouped with other windows in the taskbar at the bottom of the screen? No worries; the window isn't gone and you haven't lost anything - it's just hidden. What happens is that, by default, Windows lumps together buttons that belong to the same program, and it does this to both better organize the windows and to avoid filling up the taskbar. Five Internet Explorer windows, for example, can be kept together in one icon when taskbar grouping is enabled. Taskbar grouping might be handy for some but for most it's just an annoyance. You can stop Windows from doing this once and for all by following the steps as described below. Right-click or tap-and-hold on the taskbar. This is the bar that sits on the bottom of the screen, anchored by the Start button on the left and the clock on the far right. In Windows 10, click or tap Taskbar settings in the menu that pops up. For Windows 8 and older, choose Properties. A Window called Settings will open. Windows 8 calls it Taskbar and Navigation properties, and older versions of Windows call this screen Taskbar and Start Menu Properties. Go into the Taskbar tab at the left or top of the window and then find the Taskbar buttons: option. If you're using Windows 7, Windows Vista, or Windows XP, you're wanting to look for the Taskbar appearance options at the top of the Taskbar window. Windows 10 users can skip this step entirely and go straight to Step 4. The screenshot on this page shows this window in Windows 10. Other versions of Windows show an entirely different kind of window. For Windows 10 users, next to the Combine taskbar buttons option, click or tap the menu and choose Never. The change is saved automatically, so you can skip the final step below. For Windows 8 and Windows 7, next to the Taskbar buttons: option, use the drop down menu to select Never combine. See Tip 1 at the bottom of this page for another option you have here. For Windows Vista and Windows XP, uncheck the Group similar taskbar buttons checkbox to disable taskbar button grouping. If you're not sure exactly how this option will affect your system, the small graphic at the top of this window (in Windows Vista and XP only) will change to demonstrate the difference. For most newer versions of Windows, you have to actually accept the change before you can see the results. Click or tap the OK or Apply button to confirm the changes. If prompted, follow any additional on-screen directions. Search for taskbar in Control Panel and open Taskbar and Navigation, or browse for Appearance and Themes > Taskbar and Start Menu, depending on your version of Windows. You might have to log the user out and then back in for the registry change to take effect. Or, you can try using Task Manager to close down and then reopen the explorer.exe process. 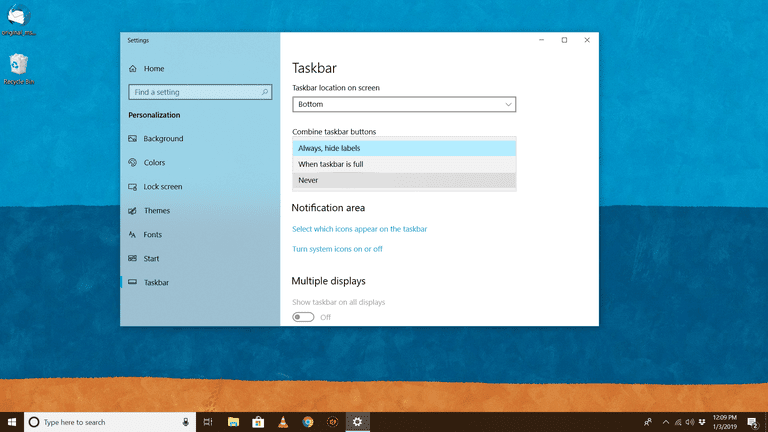 In Windows 10, Windows 8, and Windows 7, you can instead choose the option called When taskbar is full or Combine when taskbar is full if you want the buttons to group together but only if the taskbar gets full. This still lets you avoid grouping the buttons, which can be annoying, but it does leave the combining capability open for when the taskbar gets too cluttered. In Windows 10 and Windows 8, you can enable the Use small taskbar buttons option to reduce the button sizes. This will let you have more windows open without forcing the icons off the screen or into a group. This option is included in Windows 7 too but it's called Use small icons. The taskbar settings is also how you can auto-hide the taskbar in Windows, lock the taskbar, and configure other taskbar-related options.